Need to tap into one of your fluid tanks but can't get to the inside to use a traditional bulkhead tank fitting. No worries, USI RV has a solution for you. 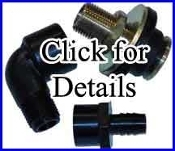 The USI RV designed Bulkhead Blind Tank Fitting installs in less then 5 minutes providing a mechanically solid, fluid tight connection to your tank. Simply drill a hole into your tank, insert the fitting, tighten the engagement nut and your done. The BBTF is machined from solid 360 brass and utilizes a flexible PVC sealing grommet (not designed for flammable liquids or potable water). 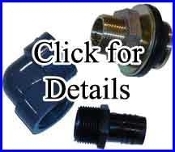 The standard NPT end allows attachment of standard plumbing fittings of your choice. 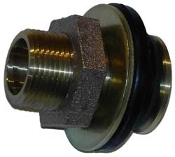 Note: 3/8" works with up to 3/16" tank walls, 1/2" and 1" works with up to 1/4" tank walls. Scroll to bottom for Engineering Testing Highlights. Now tap into your fluid tank with ease. The 3/8" Bulkhead Blind Tank Fitting (TSK190BTF) from USI-RV makes it a snap. Now tap into your water tank with ease. The Bulkhead Blind Tank Fitting from USI-RV makes it a snap. 1" Polypropylene elbow with a 1" mnpt to 3/4" barb fitting. Click image to buy. 1" elbow with a 1" mnpt to 1" barb fitting. Click image to buy. Extensive engineering and field testing of the Bulkhead Blind Tank Fitting (BBTF) has been conducted over the years including, but not limited to, testing by the United State’s leading 3rd party testing agency in the fall of 2012. -- Field testing and Engineering 100 psig testing were conducted with temperature ranges between -15 °F thru 110°F. Note: below freezing testing was done with air filled tank only. Although USI-RV designed the BBTF for non-pressure tank environments the testing sighted above proved that the fitting is well suited for low pressurized ( < 100 psig ) environments as well. In pressurized environments proper safety precautions must be followed.